A report by the Royal College of Physicians reveals that while open discussions are fundamental to managing care, giving patients choices and control over the rest of their lives, professionals continue to find them challenging. But significant improvements are possible, with the nurse-led work of Royal United Hospitals Bath NHS Foundation Trust showcased in the report. Five years ago, it began a quality improvement project designed to improve conversations about end of life care, which started in one ward and has now spread throughout the trust. In practice, as part of ward multidisciplinary meetings, staff consider whether a patient might be in the last few weeks or months of life or has an uncertain future, explains her colleague, Rachel Davis, a clinical nurse specialist in palliative care. ‘We encourage staff to be more active in their communication with patients and families around uncertainty, listening to what matters most to the patient at this time,’ she says. C - consider patients with a poor prognosis or end of life care needs. H - have conversations with patients and their families. A - advise your team of the outcome of those discussions. T - transfer information when the person is discharged. ‘Throughout, we’ve tried to keep the messages simple,’ says Ms Meehan. ‘We were finding that staff were having meaningful and important conversations with patients, but they were getting lost in the body of their notes,’ says Ms Meehan. Now a symbol against a patient’s name on the white board acts as a prompt to ensure the steps are followed. Through expert coaching and role modelling, care home staff feel more empowered, while the feedback from families has been overwhelmingly positive. Questionnaire feedback shows they have trust and confidence in the service, have been treated sensitively and given good emotional support. ‘It’s made a huge difference,’ says Ms Roberts. Having end of life discussions with patients who have dementia can be particularly challenging. ‘We need to be having these conversations much earlier, when people have capacity, rather than in the last year of life, when you’re more likely to be talking to their families,’ says Sharron Tolman, a consultant Admiral Nurse with the charity Dementia UK. 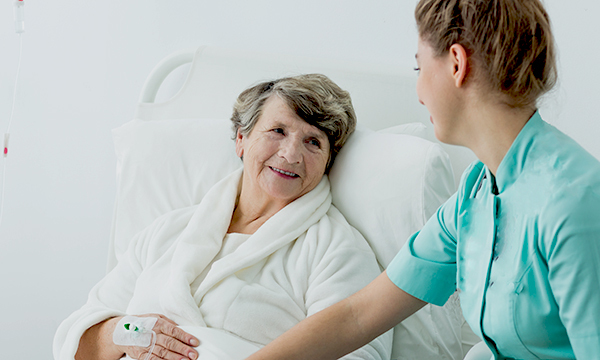 How can advance care planning improve end of life care for nursing home residents? Why is future care planning so important for people living with frailty? How can I raise the subject of advance care planning?